The Bourne Supremacy Movie Trailer. Matt Damon, Joan Allen, Brian Cox, Julia Stiles and Karl Urban star in the second installment of the Bourne film franchise. 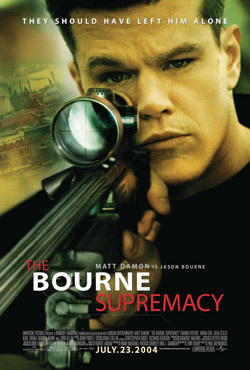 See the movie trailer, DVD and blu-ray special features for The Bourne Supremacy below. Still haunted by a murky past, ex-CIA killer Jason Bourne (Damon) attempts to piece together the shards of his life while protecting his girlfriend (Franka Potente) and thwarting an international incident. MPAA Rating: (PG-13) for violence and intense action, and for brief language. The second chapter in the “Bourne Trilogy,” based on Robert Ludlum’s best-selling espionage novels, reaches the screen in this sequel to the 2002 thriller The Bourne Identity. Jason Bourne (Matt Damon) has abandoned his life as a CIA assassin and has been traveling beneath the agency’s radar, eventually reconnecting with Marie Kreutz (Franka Potente), the woman he loves. But Bourne is haunted by vivid dreams and troubling memories of his days as a killer, and he’s not certain how much really happened and how much is a product of his imagination. When Bourne is led out of hiding by circumstances beyond his control, he must reconcile his past and present as he struggles to keep Marie out of harm’s way and foil an international incident with dangerous consequences. The Bourne Supremacy also features Joan Allen as one of Bourne’s superiors, while Julia Stiles and Brian Cox reprise their roles as intelligence agents from the first film.